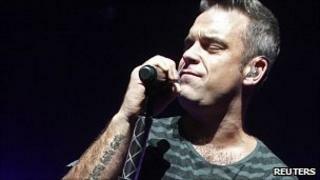 Robbie Williams has topped the UK album chart for the ninth time with his second greatest hits compilation, In And Out Of Consciousness. The double album went straight in at number one, making Tinie Tempah's Disc-overy drop one place to two. Sir Cliff Richard also made a return to the album chart with his swing record Bold As Brass a new entry at three. Meanwhile Cee Lo Green held on to the the top spot in the singles chart for a second week with Forget You. Bruno Mars moved back up the chart two places from last week's number four with Just The Way You Are. The highest new entry was dance tune Barbra Streisand by DJ collaboration Duck Sauce. And X Factor winner Joe McElderry's Ambition - his first release since his winner's song last year - entered the chart at six. Thanks to a rendition by contestant Aiden Grimshaw on the reality show last week, Mad World by Michael Andrews featuring Gary Jules jumped up the chart 40 places to 26. There were three other new entries in the top 10 of the album chart - Electronic music act Magnetic Man went in at five with their self titled album while Scottish band Belle and Sebastian came in at eight with Write About Love. American rockers Alter Bridge entered the chart one place behind at nine with AB 111.